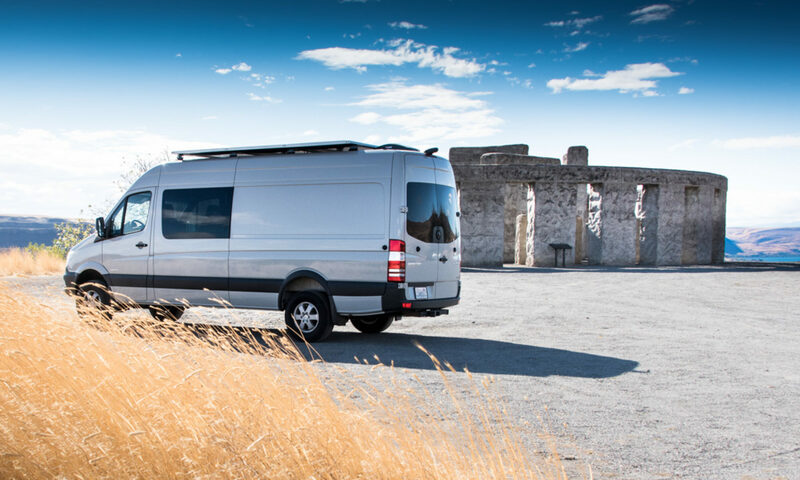 We moved the passenger seats towards the back of the van, and added l-track to hold down an additional floor layer on top of the factory floor. That meant several big changes to the factory wood floor insert. First, new holes for the brackets where the bench seat mounts. We moved it to the third row location. Before we took the floor out, we used a pin to push through the rubber floor mat (which has the seat locations marked on it with little moulding indents) into the wood underneath. That meant we had locations marked for cutting the recesses. Next, we just had to trace the entire outlines (we used the front half of the wood floor turned up-side-down over the back half) and then cut them out. It was easiest to drill holes in each corner with a Forstner bit, and then use a circular saw to cut the lines between each pair of holes. That way, we got the nice rounded corners to the hole just like the factory version. 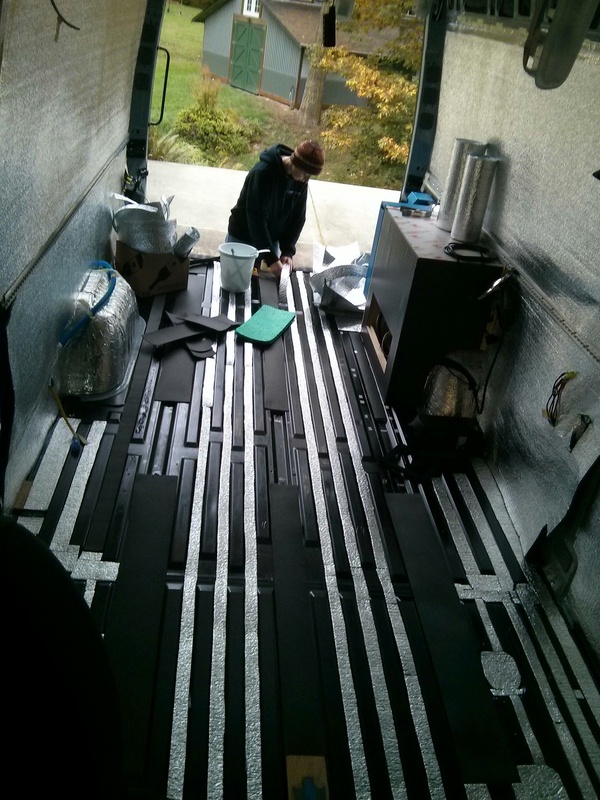 Next, we drilled holes in the metal van floor where we needed the L-track to fit. This was much easier with the wooden floor out, because we could line the l-track up on the van floor ribs. However, we needed the holes in the wooden floor to line up with the holes in the metal floor. We put the floor back in place, and then lay underneath the van and drilled up through each hole in the metal floor and through the wooden floor section. Now, we had matching holes in the metal and wooden floor sections. We enlarged the holes in the wooden sections just a little to allow for expansion/contraction and to make up for any holes we may have drilled on a slight angle from underneath. We also had to cut out parts of the floor to fit around the battery box, and for the water tank box that will eventually sit above the other rear wheel well. Before reinstalling the wooden floor, we painted the metal with a rust inhibitor paint. The factory paint was really thin and had some areas where swarf or dirt had been left on the bare metal, making pinholes through the paint. We also filled in the gaps between the ribs with some leftover foam strips. This may or may not make any difference to the final noise and heat levels in the van. Hopefully it does make a difference, because the strips took two days to cut and stick in place. Everything in this build so far seems to take longer than you think it should. Any update on if the foam strips made any difference on noise/insulation of the floor? We laid the foam strips before we put down the rest of the floor, so we don’t have any comparison point really. I’d say they weren’t detrimental in any way, except maybe if we ever spilled water under the floor. Then, the floor would probably dry out better with an air gap rather than the closed cell foam. Would this BedRug product called VanTred be a useful product in insulating the Sprinter floor? Maybe, because it has a 1/2″ of poly foam in it. However, I’ve not seen it and I don’t know how solid a foundation it would be for putting cabinets, etc. on top of. It also limits you to the grey flooring color and texture. 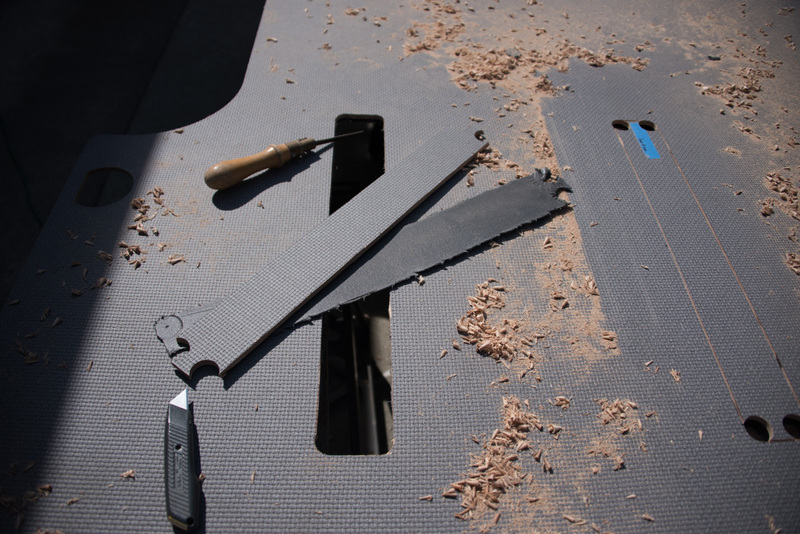 Great if you’re looking for a replacement to the factory rubber floor liner that you get in the crew vans, but maybe not as multi-purpose as Minicell foam under then factory wood floor. I was thinking of the VanTred possibly being used under the factory wood floor. While I have no experience with the VanTred product line, I have used a TruckBed liner for six years with excellent results. It looked as good as new when I sold the truck.